David T. Bittner has been a resident of Hartland, Michigan since 1971 and is married with three adult children. He has been a practicing attorney since 1992 with a focus on real estate, business law, estate planning, personal injury and family law. Working with James F. Barley, known for his expertise in real estate planning, for 12 years has given Mr. Bittner exhaustive knowledge of this area of law. In addition, he is a member of the Real Estate and Family Divisions of the State Bar of Michigan and the Livingston County Bar Association. Mr. Bittner graduated from Hartland High School in 1977 and then proceeded to obtain his BS in Business Administration from Cleary University in Howell. 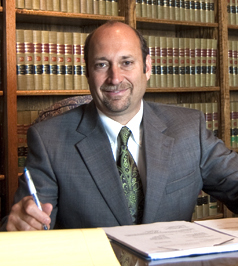 He graduated from Thomas M. Cooley Law School in 1991 and was admitted to the Michigan State Bar in 1992. Prior to attending law school, Dave was employed at Brighton/Wilson Ford for 11 years. Mr. Bittner has been active in his local community for many years coaching baseball, softball and soccer. He regularly sponsors baseball teams and has been counsel to the Hartland Area Youth Athletic Association Executive Board (HAYAA). He was appointed as a member and then elected Chairperson of the Hartland Township Zoning Board of Appeals for 8 years. He is former counsel to the Hartland Township Parks & Recreation Committee and also served on the Hartland Township Compensation Committee. He is also counsel to the Hartland Area Historical Society. Mr. Bittner enjoys working with people and finds it very rewarding to help his clients navigate challenging situations. He firmly believes that his clients are his employers and that he is here to serve them to the best of his ability. Mr. Bittner always strives to take whatever time is necessary to ensure that his clients are well informed of all aspects of the situation.